Being the fantastic son that I am, I thought for father's day that I would introduce my father to the wonderful world of Belgian beers. This evening we finally cracked these beers and I must say it was a very successful introduction for my father. 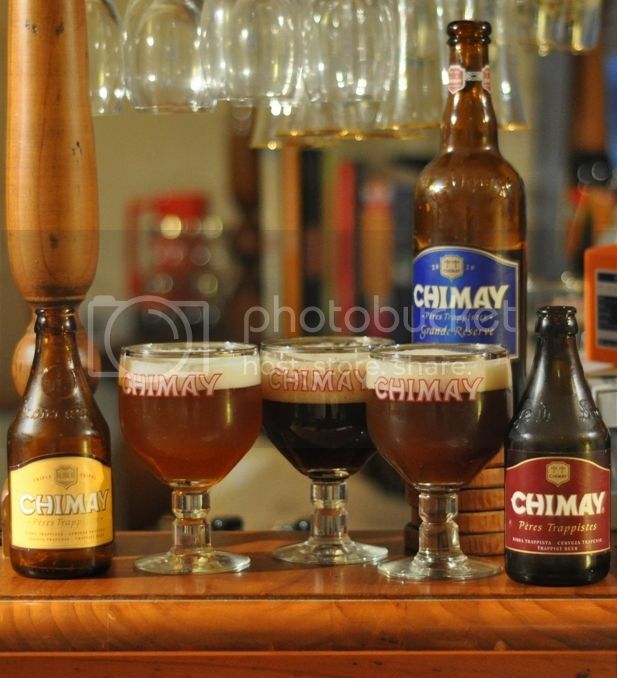 Bières de Chimay S.A. or simply Chimay for short is probably the best known of the Trappist monasteries. The brewery was founded in 1862 and have been brewing these three beers almost ever since. Unlike many other breweries the beers do not increase in percentage the darker they get, infact the lightest coloured beer is actually the tripel (white). I could probably go on about this brewery for ages, but I should probably start talking about the beers themselves. So fun fact about these beers, because you want to drink all of these beers at different temperatures if you pull all of them out of the fridge at the same time and pour all of them. If you take your time drinking them in order (red, white, blue) you will drink them at close to the right temperature, anyway... So these beers have to be drunk in their correct glass, not hard to find on ebay, literally all you do is tip the bottle in and it pours perfectly with the head right up to the rim of the glass. These beers do have sediment so make sure to store them upright in your fridge. The pour will look slightly cloudy but really the beers look amazing. Half-way through I'm starting to see why I normally review just one beer at a time. The aroma's of these beers are all sweet. They all have hints of dark caramel and fruits, which are all grown inside the grounds of the monastery. There are definitely hints of cherries and strong earthy spices. These flavours all intensify on the way up through the beers. The white is the only beer with any noticeable hops and the Grand Reserve (blue) has a wafting of alcohol. All three are very enticing. My father is definitely more of a wine drinker than a beer drinker but he is slowly gaining an understanding of the palate needed for beer. However his first comment had me worried when he sipped the red and said that this is not a beer. After he explained what he meant to me I deduced that he was put off by the lack of hops and the sweetness of the beer. I can see why some people don't like it, but really this is a spectacular beer. The white, which has a very gold label to be called white..., is more hoppy and therefore accessible to the average beer drinker. While the blue is a cacophony of flavours and just blows the senses, it is by far the best of the three and is simply a must for anyone who considers themself a beer lover! Now in conclusion all of these beers are fantastic! The blue is by far the best beer but may be somewhat inaccessible to the palate of someone who drinks Carlton Draught everyday, if you fit into this category I would definitely start with the Chimay white, to get used to the sort of flavours you might expect before jumping into the red or the blue. The red would make a superb after dinner beer, perhaps with strong cheese or dessert. And then the Grand Reserve. DO NOT serve below 12 degrees it just kills the flavour, this is one of the best ales in the world and can be enjoyed on it's own or with any style of food. I think I have finally converted my father to beer, in part due to the ammount of flavour you can get in one of these beers for one tenth of the price of buying a bottle of wine of similar flavour depth. Simply put; these are the best Trappist ales in the world, get out and get some!